Last August I was lucky enough to receive a set of the brand new Kendo Taikai (kendo playing cards) from it’s creator, Ákos Vachter from Hungary. Having never seen or even heard of anything like this, I was quite exited to see what it was like. The first thing that I noticed about the game when I got it was the professional quality of the presentation. The design is attractive, the cards stiff and long lasting, and – in general – the whole package was great. My only real disappointment in this respect was that the game board is not included in the package, you have to (if you want to use it that is) download it separately. 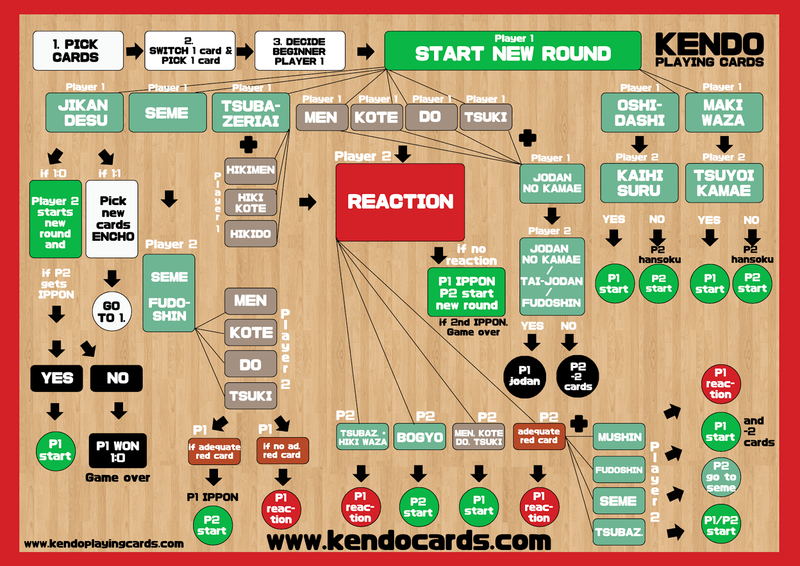 The cards are split into three colour-coded types – shikake-waza (brown), oji-waza (red), and special cards (green) – and you play these, individually or in combination, to attempt to score an ippon on your opponent. I couldn’t wrap my head around the instructions at first but – after the instructional videos came out – things became clearer much quicker. Rules and an instructional video for an easier version of the game (called Musashi’s challenge) also came out as well, which makes gameplay a lot less complex, so if you prefer you can start of with the easier version (btw, as I was playing the full game with my friends we came up with our own versions of the meanings of some of the special cards, which made it even easier to understand for us). The game is something that you have to play quite a few times with friends in order to ‘get it’ but once you get to that stage it is quite fun. I think it’s the type of game that – because it’s so mobile (you can play with one set of cards and no board) – you whip out at kendo parties once a few beers have been had and challenge your sempai and sensei. I’m sure university students could make a drinking game out of it as well !! As we are coming up to xmas, perhaps – at a fraction under 16 Euros for a set – this would make a nice gift for a kendo friend or activity at a dojo party. Try it! !